Obesity is a very high buildup of fat in the body that makes the weight is beyond the ideal limit. 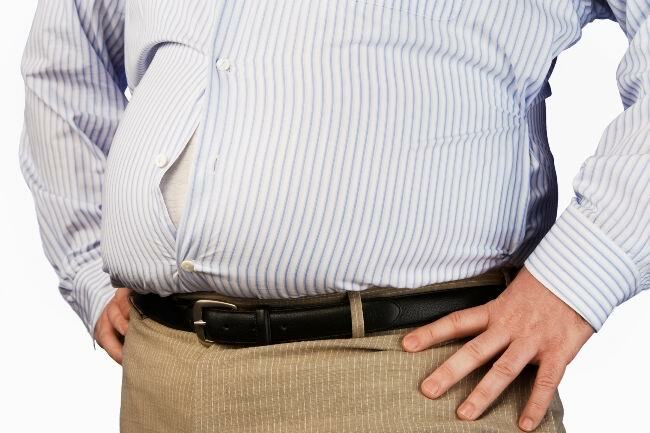 A number of complications can arise due to obesity, even some of which endanger life. Some examples of serious complications include stroke, coronary heart disease, type 2 diabetes, colon cancer, and breast cancer. In addition to leading to a number of physical health problems, obesity can also cause psychological problems, such as stress, and depression. This psychological problem arises because it usually starts from the self-confidence of obese people who experience changes in body shape. To find out if your weight including a healthy weight can be done through the method of calculating BMI (Body Mass Index). The formula used in calculating BMI is the body weight in kilograms divided by the height of the body in meters squared (m²). For example if a person's weight is 66 kilograms and the height is 1.65 meters, then the count is 66 / (1.65 X 1.65) = 24.2. These results fall into the category of healthy or normal weight because it still ranges from 18.5 to 24.9. If your final BMI count is less than 18.5 then you are considered underweight. Conversely, if the result is more than 24.9 then you are considered overweight. A person is deemed obese if they have an BMI calculation result between 30-39.9. Furthermore, a person is considered to be of extreme obesity if the end result of BMI is above 40. Obesity can occur when we frequently eat high-calorie foods. Actually, eating high-calorie foods is not always a problem as long as it is in accordance with the activities performed every day. However, if we spend more time sitting and not offset by active exercise, the remaining energy from the burning of calories will be stored in the body in the form of fat. Gradually, the buildup of fat will increase and make the body look bigger aka fat. Based on data compiled by the World Health Organization (WHO) in 2008, about 4.8 percent of the total population of Indonesia is obese. It is estimated that this condition is experienced by 6.9 percent of men and 2.6 percent of women of all populations. Obesity can be handled alone with the discipline of applying a healthy diet, such as eating foods low in fat and sugar, and exercise regularly. Sports in question does not need to be heavy because the activity goes early, cycling, playing badminton, or swimming is enough, as long as done regularly. It is recommended to exercise 2.5-5 hours per week. Handling from a doctor can be given if obesity is not successfully overcome despite being disciplined in exercising and applying a healthy diet. Examples of treatment from a doctor is a drug that can reduce the absorption of fat in the digestive tract. In some cases, obesity will be treated with surgery. Surgery is usually only done if the level of obesity is considered so severe that it is feared can threaten the lives of patients. Operative measures are also considered if efforts to lose weight that has been done for some time still not work. Keep in mind that weight loss is done by own business takes a short time. Therefore it takes patience to achieve the desired results and commitment to maintain it in the long run. Obesity can occur when we often eat high-calorie foods with no offset by the appropriate physical movement. When the energy generated from burning calories is not used, then the body will store it in the form of fat. Over time, this fat will continue to overlap and become obese. The average caloric requirement for physically active adult women per day is about 2000, while for physically active adult men it is 2500. But the problem is that most of us rarely move. Either caused by a binding job (such as having to sit in front of the computer all day) or because we prefer to spend leisure time relaxing, watching tv, playing video games, or sleeping. In fact the work factor should not be an excuse because we can still use the spare time at least half an hour every day for exercise, as well as walking fast in the morning / afternoon, cycling, or doing aerobic exercise. But often this positive thing we do not do, let alone the physical inactivity is exacerbated also by our habits eat large amounts of food, the joy of eating fast food, sweet drinks, or even consume alcoholic beverages. Heredity or genetics inherited from parents. Drug side effects. Some types of drugs that can cause weight gain are antidepressants, antipsychotics, antiepileptics, steroids, diabetes drugs, and beta blockers. Pregnancy. When pregnant, women will need a lot of nutrients from food intake. But not a few also from those who have difficulty to recharge her body after giving birth. Lack of sleep. Hormonal changes that occur when we lack sleep can increase appetite. This can lead to obesity. Growing age. The older our age, the greater the risk of weight gain. This is caused by decreased body metabolism and reduced muscle mass. Arthritis. A person who has arthritis will usually be difficult to move. This condition makes the activity limited so vulnerable to gaining weight. Cushing's syndrome. Patients with this condition have high levels of the hormone cortisol in the body. Cortisol is one of the hormones that can increase appetite. Polycystic ovary syndrome. This condition can disrupt the balance of hormones in the female reproductive system. Hypothyroidism. This is a disorder of the thyroid gland that can cause the production of important hormones to be less or even stopped. The main way to know someone is obese or not is through the measurement of body mass index (BMI) by comparing body weight and height. Figures or calculations that are usually made as a benchmark medical condition obesity is 30 and above. In addition to calculating BMI, doctors may also calculate hip and waist circumference comparisons, measure the thickness of skin folds, and perform scans with ultrasound, CT scan and MRI to determine the levels of fat and its distribution in the body. The results of the calculation of waist circumference can be used as a doctor as a reference whether the patient is at risk of obesity-related diseases, such as heart problems and diabetes. The risk of developing the disease will increase if the patient is male and has a stomach circumference of more than 102 cm or a woman with an abdominal circumference of more than 80 cm. The doctor may offer other advanced examinations, such as blood tests (including checking sugar levels, cholesterol levels, thyroid function, and liver function) and cardiovascular examination via electrocardiogram to determine the level of risk of obesity-related illness. Losing weight to a safe size for health is a major goal of obesity treatment. If you suffer from obesity, it is advisable to cut 600 calorie intake per day constantly in order to lose weight safely. The safe weight loss for obese people is about half a kilogram to one kilogram per week. That is, if you are a man suffering from obesity, then total caloric intake per day should not be more than 1900 calories. Whereas if you are a woman with obesity, then the intake of calories per day should not exceed 1400. Avoid foods and drinks that contain high fat and sugar. In addition, avoid consuming alcoholic beverages. It is recommended to increase the consumption of high-fiber foods, such as vegetables and fruits. Other types of healthy foods are brown rice, eggs, low-fat meat, beans, fish, potatoes, and whole grain bread. If you want to buy food or beverage products sold on the market, always note the caloric levels listed on the product label. Avoid eating foods that contain too much salt because it can cause hypertension. In addition to applying healthy eating habits, other things you should also apply to overcome obesity is to exercise regularly. It is recommended to exercise for two and a half hours up to five hours per week. Examples of easy exercises are a leisurely walk in the morning or evening, jogging, swimming, playing badminton, or casual biking. To support your success in treating obesity, ask your family or friends to support and motivate. Also, avoid situations that will tempt you to eat unhealthy foods or eat uncontrollably. If necessary, ask for help from a psychologist to help improve your perspective on food or diet. Do not forget to always monitor the results you get by routinely weighing the body and keeping track of it to make comparisons with the following weeks. Handling of obesity with drugs will usually be advised by doctors if weight loss is not successfully lowered by the adoption of a healthy lifestyle alone. Medication is usually only done by doctors if your BMI reaches 28 or more, and you have diabetes or hypertension. Drugs that are often prescribed by doctors to treat obesity are drugs that contain orlistat. This drug works in the digestive tract by blocking the absorption of fat by the body. Side effects of moderate orlistat use, namely dizziness, abdominal pain, abdominal bloating, and become difficult to hold and frequent bowel movements. The stools of someone taking this drug look like oily. This is caused by the disposal of fat that is not absorbed by the body. If the orlistat managed to lose five percent of body weight within three months, the use of this drug should be continued. But if within that time there is no meaningful weight loss, then this drug is not effective for you and you should see a doctor again to find an alternative solution. The surgical procedure is usually only recommended if the obesity suffered by the patient has reached a very dangerous level. Although surgical procedures promise quick results, it does not guarantee that weight loss can be sustained over the long term. The results of surgery will be maintained if he wants to change his negative lifestyle habits into a healthy lifestyle. Two examples of surgical procedures for dealing with obesity are gastric bypass surgery and laparoscopic adjustable gastric banding (LAGB) surgery. Gastric bypass surgery is done with the aim of limiting the amount of food that enters as well as inhibit the absorption process by making a small sac above the stomach and the new path from the small sac to the small intestine without passing through the stomach. While LAGB surgery is almost similar to gastric bypass, which aims to slow down the process of food consumption so you feel full faster and ultimately reduce the amount of food intake. This procedure is done by installing a bracelet clamping device around the hull. If obesity is a symptom or complication of a disease you are suffering from, for example, diabetes, hypertension, obstructive sleep apnea, or polycystic ovary syndrome, the doctor will adjust the treatment to the underlying condition. In such cases, the treatment usually will be referred to a related specialist. Obese people can experience difficulty in normal daily routine due to their limited mobility and tired and sweaty physical condition. In addition, obese people will also usually feel not confident and feel isolated. Often these feelings develop into depression or cause damage to relationships with others.